On a walk through the forest you might spot rows of shallow holes in tree bark. 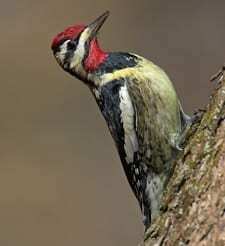 In the East, this is the work of the Yellow-bellied Sapsucker, an enterprising woodpecker that laps up the leaking sap and any trapped insects with its specialized, brush-tipped tongue. Attired sharply in barred black-and-white, with a red cap and (in males) throat, they sit still on tree trunks for long intervals while feeding. To find one, listen for their loud mewing calls or stuttered drumming.